We know your heart's probably racing right now. This is not something you ever wanted to see, is it? But breathe easy, D.C. This kitty is not covered in blood. 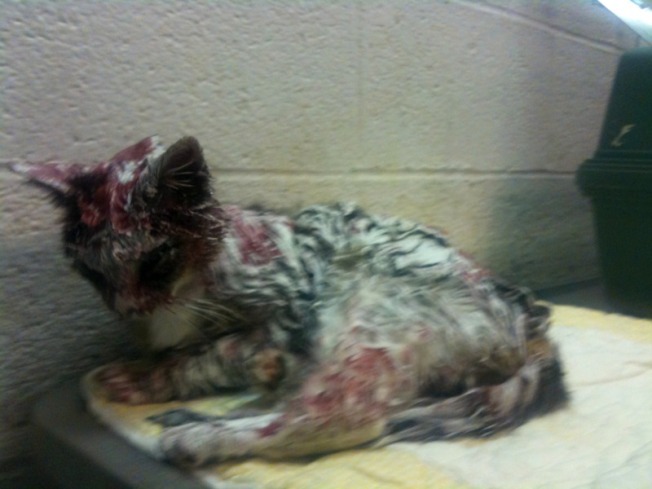 Animal Control discovered this little one on Sunday, covered in Dark Red Dried Paint of Doom, reports the Washington Humane Society's blog. The Washington Humane Society, concerned the cat may have ingested some of the paint while trying to clean herself, brought her to Friendship Hospital for Animals. Good news: The kitteh -- now called Tiffany -- was found to be healthy, but that didn't get her out of getting a seriously short new 'do. Tiffany has suffered the further indignity of being shaved close to the skin. She's headed off to foster care today, and we hope they supply her with an abundant wardrobe of teeny sweaters to hide her shame and/or keep her toasty. The Humane Society is accepting donations to help its animals here.